As you will see, this palette is made up of MAC, Anastasia Beverly Hills and Make Up Geek shades. The top row is more pink toned shades: Expensive Pink and Coppering from MAC, and Blazing and Sangria from ABH. As a copper eyeshadow lover, Coppering is perfect for me, whilst Sangria is great for a cranberry/purple autumnal smoky eye. I saw Amy (from Amy's Makeup Box) using Blazing a lot, so I knew I had to add it to my collection. It's a really unusual colour, a brown toned brick red shade that is super pigmented. I definitely need to use this more as I haven't tried it too much yet! Expensive Pink is my least used shade on this row so far, but it's a beautiful pink with gold flecks, and I imagine this would look beautiful as a soft everyday look. 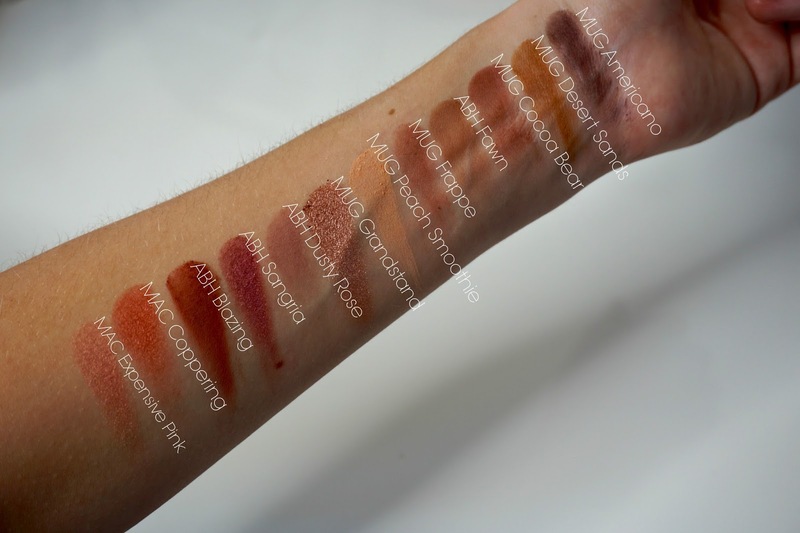 The second row is my light mattes and my favourite foiled shadow - Make Up Geek's 'Grandstand'. If you have one foiled eyeshadow in your collection, it really must be this one! It is so pigmented and buttery - perfect for applying with a wet brush or your finger. It makes every look I use it in that bit more special and the colour - a coppery rose gold - is so universally flattering. Alongside that I have ABH Dusty Rose - a gorgeous matte lilac shade (I used it with Sangria here). Then my two light transition shades from Make Up Geek - Peach Smoothie and Frappe. Peach Smoothie is fantastic for pale skin, as it's light so great for a transition shade, but still shows up on the skin. It's also a nice shade for setting an eyeshadow base. Frappe is a great slightly darker transition shade, as it's quite neutral (not veering towards warm toned or cool toned) so will work with most brown looks. And on my final row I have all my darker mattes. Firstly I have ABH Fawn which is probably the most talked about ABH shade in my mind - it's used in so many tutorial that I've seen and so I had to add it to my collection. It's a lovely warm mid-toned brown so great for darkening up the crease. Just like Blazing, I really need to give this a good go soon! I then have Make Up Geek Cocoa Bear which I use all the time to darken up the crease - it's a very warm toned brown. I then have Make Up Geek Desert Sands which is a unusual mustard yellow shade - I used it in this look, and this look. It's extremely yellow toned, but I think that makes it so original and such a fabulous transition shade for a colourful smoky eye. Definitely not a shade that everyone will love, but you'd be surprised how well it can be incorporated into loads of looks. And finally, I have Make Up Geek Americano, a well loved coffee dark brown shade with a purple undertone. This is amazing for smoky eyes, and I recently saw Keilidh use this all over the lid for a smoky eye and it looked gorgeous - definitely one to try out! And that's in for my tour around my Z palette - no doubt the first of many! I do have a small Z palette that currently only has 3 shades in it, but once I add more I will be sure to do another post. 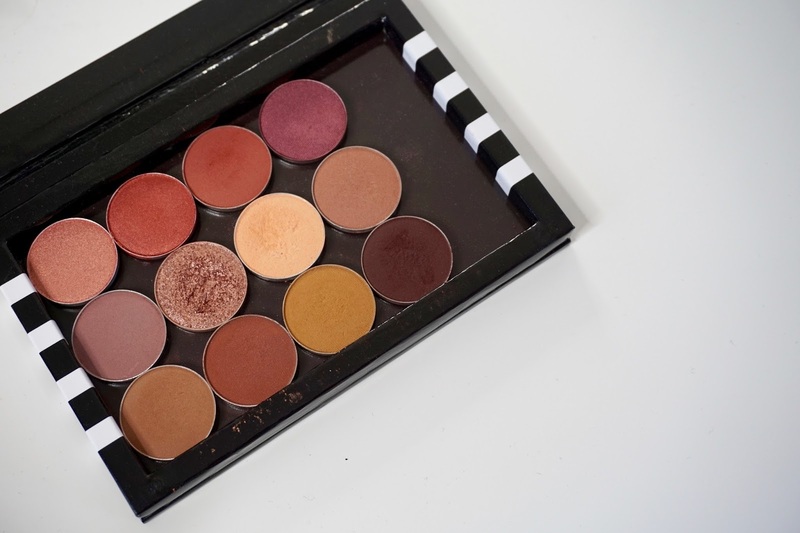 You can get Make Up Geek shadows on Beauty Bay for only £5.50 each (and they have the most amazing range!). ABH shadows are currently still only available from the US for $12 each here and also at Sephora. And obviously, MAC shadows are extremely easy to get hold of (but they are the most expensive!) for £10 a pan here - but if you are off on a trip to the US, you can get the eyeshadow pans for only $6! What are your favourite eyeshadows? Let me know in the comments!